Vault of Light: 20 Days of Gold Making - Day Four and Five. 20 Days of Gold Making - Day Four and Five. I've incorporated two questions into one post. I use both. I often go back and forth between using a bank alt and not. Both have their advantages and disadvantages but I've always used a guild bank. Using one character to handle all of your sales means that your mailbox can get clogged up pretty fast. Constantly mailing items around can cause items to get lost or backed up in mailboxes. 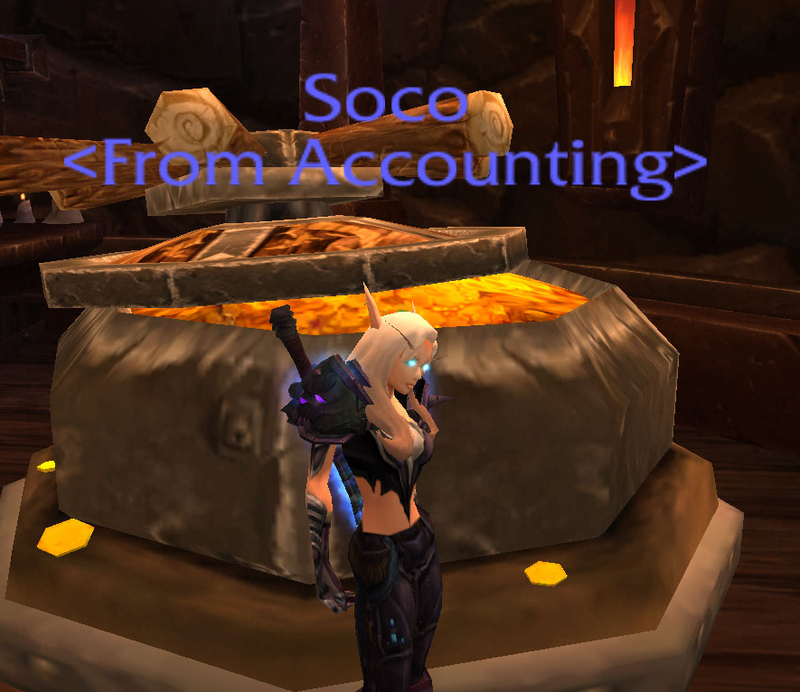 Soco was my first real bank character devoted to having her own guild bank. She handed all of my auction housing. During Wrath and Cataclysm as a raider I kept not only my main but the majority of my alts in my raiding guild. So I used Soco for selling everything. Anything I crafted was mailed straight to her, every week I'd take out the appropriate materials and send them to each of my alts for their daily cooldowns for the week. More recently having taken a bit of a break from raiding my Priest is the guild leader of her own level twenty five guild which also contains all of my alts. This makes handling materials easier as well as maintaining daily cooldowns. Anything I buy can be deposited straight into the bank rather than mailing things around every day. I prefer this method personally. Priest - JC rings and random things I pick up during daily quests as she's my most played character I like to keep her bags as clear as I can. Shaman - Flasks, potions and food. Anything required pre raid. Druid - Raid consumables such as gems, enchant scrolls, leg armours and belt buckles. Anything required post raid. Rogue - Crafted Blacksmith, Leatherworking and Tailoring crafted PvP gear as well as MoP and Cata flipping greens.